Stogie News: Bush’s Birthday Cigar? You may have missed it, but last week was President Bush’s 61st birthday. So did he celebrate with a cigar? At StogieGuys.com, we generally don’t go out of our way to celebrate presidents’ birthdays – unless they’re dead and we get a day off work. But Bush’s birthday did remind us of a little-known fact: While he gave up booze and harder drugs many years ago, he still enjoys a cigar from time to time. It isn’t in his official White House bio, but according to the Houston Chronicle these days his “chemical indulgences…are limited to coffee and diet sodas, and an occasional stogie.” That makes him only the latest in the long list of presidents who smoked cigars. The first known stogie-smoking president was none other than Washington’s heir: John Adams. (Washington grew tobacco at his Mount Vernon estate but was never seen smoking a cigar.) The first confirmed commander in chief who smoked in the White House, however, was James Madison. Some Presidents were seen more often with a cigar than without one. White House drunk and Civil War general Ulysses S. Grant smoked a reported 20 cigars a day. Others like William McKinley relegated cigars to private life.In the early 20th century, William Howard Taft, Warren G. Harding, and Calvin Coolidge were all stogie smokers. Coolidge particularly was known for ending his breakfast meetings with a cigar, and later sitting on the porch in the evening for a cigar or three. The modern presidency also had its cigar smokers. Eisenhower, Kennedy (who famously bought up over a thousand Cuban cigars the night before signing the embargo), Lyndon B. Johnson, and Richard Nixon all enjoyed their smokes. And of course Bill Clinton famously enjoyed cigars in more than one way, although the White House was made smoke free during his Presidency. 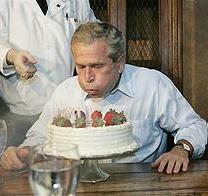 So is it possible that Bush celebrated his birthday last Friday with a cigar? We really don’t know. But given his dismal poll numbers, an hour to relax with a cigar probably would have been the perfect birthday gift. Interesting that so many presidents were cigar smokers. Other than Ulysses S. Grant, I hadn’t really thought about it before. With such an impressive list, I wonder if there’s something in the tobacco that exudes success. I work with an older gent who inhales every puff of his 2 or 3 monsters a day? While serving in Iraq in 2003, I had the distinct pleasure to enjoy a Presidential cigar when President Bush came to visit us for Thanksgiving. It was a Corona long-filler made in the Philippines.